Sherri Johnson has 20 years' experience as a top agent and is an executive at one of the top three national independent brokerages. She has recruited, trained and coached thousands of agents, and lead over 700 real estate agents to over $1.6 billion in annual sales. Stop seeing open houses as annoyances and start seeing them as opportunities. Open house attendees aren't "nosy neighbors." See them as potential future leads. At some point, they're going to want to sell. This is your chance to make a connection. See open houses as an opportunity to generate leads, not just something to make the seller happy. 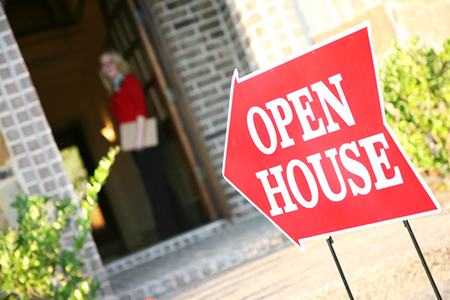 Use open houses to find more listing leads so you can get two sales from every person you meet at the open house. The National Association of REALTORS® says 75 percent of open house attendees never received follow-ups! Opportunities aren't lost; they go to someone else who will convert them. Johnson referenced Stephen Covey's quote, "Begin with the end in mind," to emphasize the importance of setting yourself up for future success. "When you do that, you approach the open house with enthusiasm, and tell yourself, 'You're going to get business doing this,'" Johnson said. Make one of your open house goals to connect with people; be enthusiastic and engage with them. Introduce yourself to every open house attendee. If they don't reply with their own introduction, it's okay to ask, "And you are?" Once you know who they are, get to know them! Questions like where they heard about the open house are a good way to break the ice without seeming intrusive. Build rapport. Learn about your clients—who they are, what they like, and what you can do for them. Let clients know you work at their pace, not yours. It may take two weeks, two months, or two years. Let them know you're going to be there for them—no pressure, just results. Stay in touch with your "pipeline leads." It may be six to eight months before someone is ready to move forward, but if you keep in touch, you're the one they'll remember and contact. Connect with them at least every three weeks via email, text, or call. Get to know your prospects. Ask them, "What's going on in your life in the next 90 days?" It could be they're changing jobs, having children, moving, or getting married. Remember, Sunday is real estate day, and you are there to seize opportunities. Schedule a time to see their current house (the size of their furniture, what they like and don't like, etc.). Then you will better understand what they want in a new home. Always be thinking of ways to save sellers time and money. Offer a homebuyer guide with valuable information on everything from highly rated home inspectors to local mortgage lenders. Don't just give your clients "a calendar and a pen." Show them how you can help them in practical ways. Drive traffic to the open house three weeks or more before the event through Facebook advertising (big return), posting on other social media, mailing open house postcards, and calling and visiting neighbors. One of the most stressful parts of the sales process is closing. Johnson tells agents to "Ask for the appointment" right away. If you don't, your open house visitors may get picked up by someone else at the next open house. "You'll get the appointment 90 percent of the time if you ask right then," she said. You can even schedule time after the open house to look at houses. Johnson provides scripts for agents who want to know more about moving the process forward and how to close the appointment. Don't wait—cement the relationship by going to their home. Being in their home and talking to them face-to-face gets you one step closer to a sale.